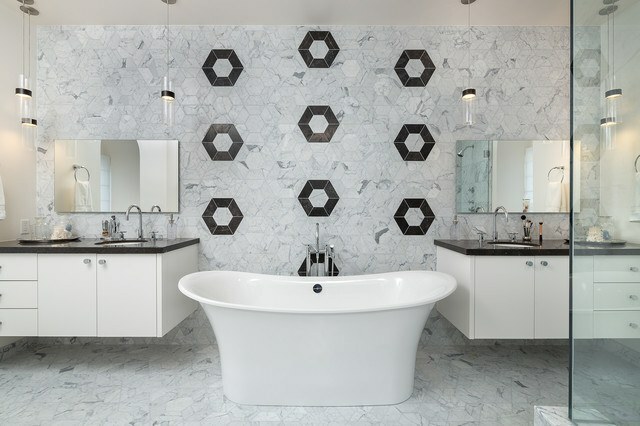 If you've passed on hexagonal tiles for remodeling projects because you thought they look dated or vintage, you're in for a big surprise. 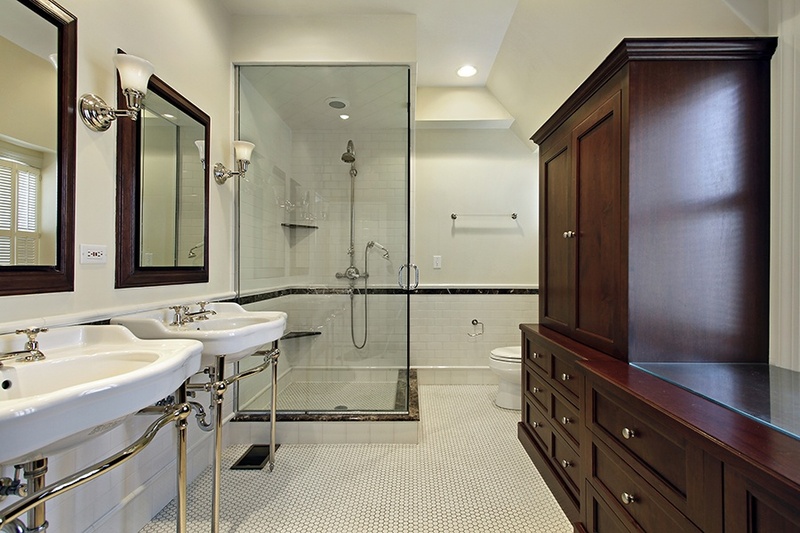 Designers have rejuvenated this classic tile into unique new designs that will inspire you to try them out again. Prepare to be delighted with supersized hexagons, unique color combinations, subtle wave effects, and more. Take a look at these six hexagonal tile ideas to open your mind to the new wonders of hexagonal tiles. Before I begin reviewing the new possibilities, let's take a look at what a standard white hexagonal white floor looks like. Here is one in marble, but it perfectly mimics the look of a vintage hexagonal floor. The white is all one hue, there are no variations of white, like pinkish or beige white, that people are familiar with today. Now, imagine the same floor with a subtle textural and color differences in white between the tiles and you'll start to see a "wave" effect take place that makes the tile even appear to ripple when light falls across them, like in this marble design using slightly different colored tiles to produce the beautifully entrancing effect. They end up looking like dappled waves in a pond. If you want to even strengthen the "waviness" then you can also use shiny smooth tiles mixed with matte finish tiles or use tiles made with a white marble that has a bluish hue. 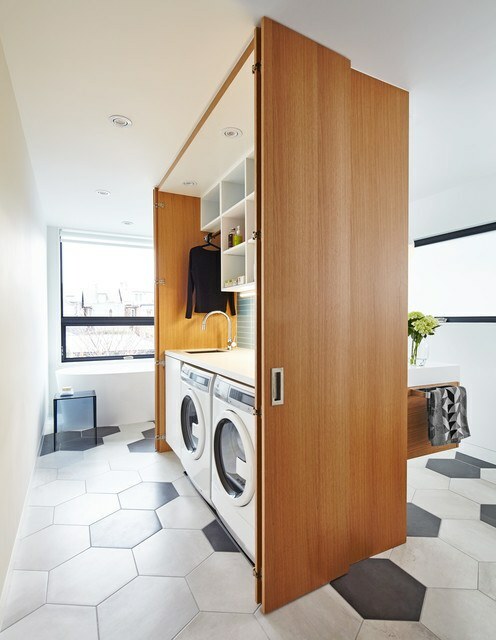 While the above example shows you how to use a standard penny style hexagon in a new way, the most recent innovations in hexagon tiling involve size. If you use a company that can custom cut tiles to your preferred size, then you can get some very interesting new hexagonal designs. They can produce any size of hexagonal tile that you desire from small, medium, to large and everything in-between. 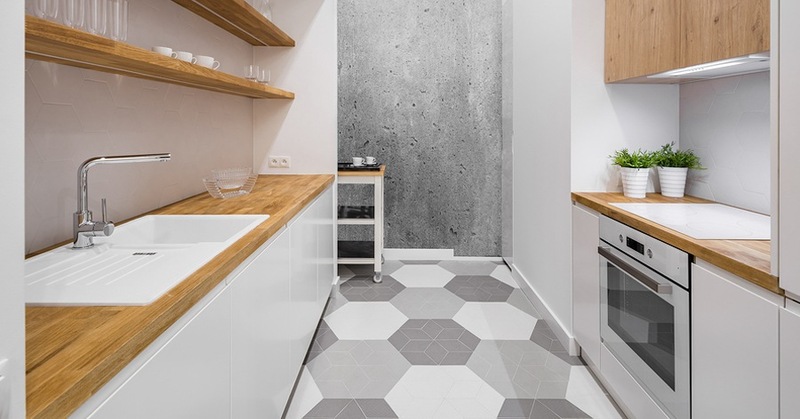 By supersizing the hexagonal tiles, you can create floors with a large "wow" factor, like this one. Modern tastes are far more whimsical and less rigid than in the past. Instead of thinking an odd placed color in a pattern is a mistake, most people understand the use of color in far more abstract patterns and appreciate these quirky designs, especially in modern themed spaces. That's why you can have a floor or a wall with three different colors in a splatter pattern and it looks great. While this design is muted black and whites in different tones, the idea would still be the same for colored hexagonal tiles. You can add a touch of color with a stray yellow or red tile with a splatter pattern of other hues and it can really produce unique designs that pack a visual punch. The opposite way a splatter design in hexagons is surprising, a polka-dot design can be calming. Any pattern that repeats over and over, with two or more colors, can be effective at creating a pleasing and soothing space. In this design the hexagons are larger than the normal penny size, but still put together in a sort of polka-dot pattern that is visually interesting, but not all together boring, simply because it is comprised of three different colored hexagon tiles. It's not a true splatter pattern because the design appears uniform and not broken, but it is not a true polka dot because it has more than two colors involved. Hexagon tiles when supersized and bordered can be used in the same way as hanging permanent artwork on your tiled walls. 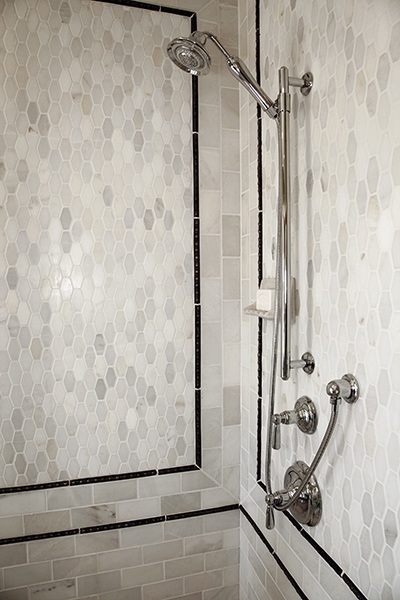 The hexagon shape is perfect for an accent tile and can break up an otherwise plain design with spots of color or bordered focal points. it makes them ideal for use as abstract murals, or even just a highlight going up a staircase, on stair risers, or in odd spaces where a hint of color or a framed image is needed to add your unique design touch. While this design only offers a black and white bordered accent wall design, you can take the same idea and use color and borders to create accents in spaces that just need a little something extra to give it a good design boost. If you prefer hexagons with less sharp edges and something interesting in the middle, don't overlook water jet tiles. They can produce hexagonal tile patterns with flowery images in the middle. The tiles themselves might be square, but the designs that the water jet can produce include hexagonal designs with different types of marble in them. Not only is this the height of luxury, but it can produce hexagonal designs that are quire intricate and lovely, with no seams in between. This Crystal tile from the Effusion collection is an example of a water jet tile that has a hexagonal feel to it and would make a stunning floor, countertop, or wall. As you can see from the examples I've provided, hexagonal tiles are no longer just small penny-sized tiles in monochromatic color schemes. They can be made available in any size you want, as long as you get a supplier who does custom sizing and cutting. We are seeing an emphasis on color management with hexagonal tiles. There are wavy, splattered, and polka-dot effects that new designers can produce with different colors, sizes, and finishes. 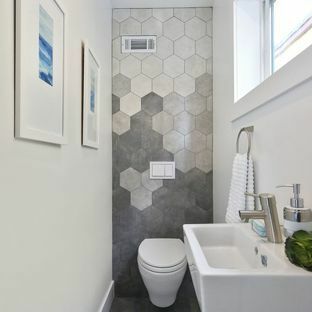 Large hexagon tiles mimic framed artwork and are effective when used as accent tiles in small spaces, similar to when you hang a small framed picture on a wall. Water jet technologies have also begun to be used to produce intricate hexagonal designs even though the tile itself may still be square. These new design options have catapulted hexagonal tiles back in the limelight and made them a more modern and refreshing option than vintage hexagonal penny tiles. If you want to explore new ideas on hexagonal tiling or have questions about the use of hexagonal tiles in your next design project, please contact us.